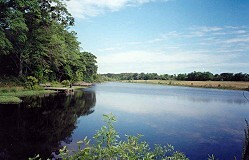 The three Bar-D lakes are located on Perry County 20 about six miles from the Donavan Lakes. Bar-D is a part of the Donavan Lakes Fishing Club. 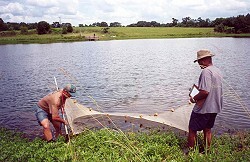 Bar-D Fishing Club, Marion, Alabama, was established (lakes drained and drainage systems rebuilt; fish stocked) in 1994 as an exceptional outdoors opportunity for the family ... a place for wholesome, safe, fun for families looking for an experience in the country that produces good memories and exciting times. 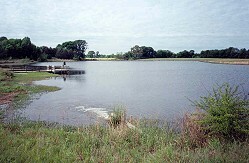 There are three lakes covering about 45 acres. We are presently catching bass over 14 pounds and a few coppernose bream close to 2 ½ pounds. There are a few catfish in Lake Roy weighing over 20 pounds. I.D. 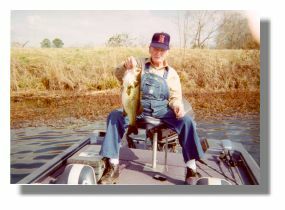 Murphy, 90 years old, caught a 9 1/2 pound bass on a plastic worm at Bar-D Fishing Club in April 2000. "We always catch good bass at Bar-D. 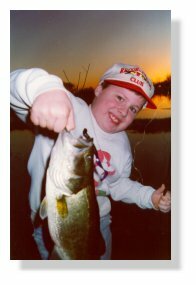 I caught two bass weighing over nine pounds and then a big one broke my line (Labor Day, 2000). I've caught lots of seven pounders. The dues I pay for my Bar-D Fishing Club membership are the best money I have ever spent for recreation," Evertt Cearlock (75 years young and living in Centreville, Al.). "We caught a 10 1/2 pound bass from the Lake Gayle pier and then caught a 3 lb bluegill from the Lake Ely pier. The next day we caught a 2 1/2 coppernose bream from the Lake Emma Lou pier...man, pier fishing is great at Bar-D," Randal Cowart, Brent, Al. 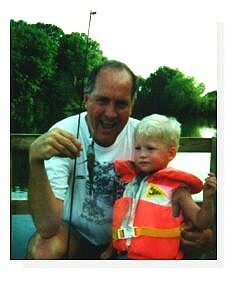 Randal Cowart caught a 12 pound bass from the Lake Ely pier on Tuesday, 7 May, 2002. I took a photo of this monster bass...Manager Wilson. 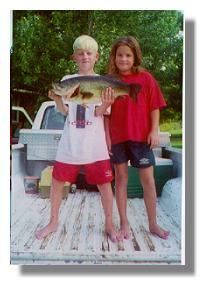 Vincent Thornton, Tuscaloosa, caught a bass over 14 lbs from Lake Gayle in February of 2003. 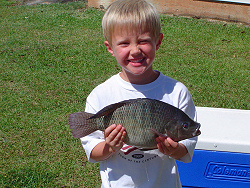 Cole Ferguson from Tuscaloosa with a nice tilapia from Lake Emma Lou. This was the first trip to Bar-D for Cole and his father. Looks like they had a good start in the Club. Grandson Hudson with a big Bar-D bass. Sister Lauren catches a lot of fish too. Lake Roy holds giant catfish and very large bass and bream. The two piers are usually in the shade and there is a great picnic and camping area in the tree line. Notice: Due to a leak, we drained Emma Lou in August, 2012. There are four fine fishing piers. We have electrical outlets free of charge. A picnic table, two big oak swings and plenty of shade trees. There are four security lights. Wildlife such as deer, turkeys, waterfowl, songbirds, otter, raccoons, beaver, nutria, coyotes, and other creatures are commonly seen around the lakes. Bryozoa, called moss animals, build cellulose blobs in some of the lakes at Bar-D. 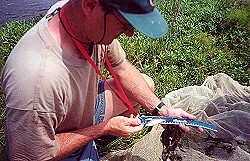 These microscopic plankton feeders do not harm the fish and they are interesting animals to observe and study. There is an outstanding RV (selfcontained) pad next to the Lake Gayle pier at Bar-D. The security light and electrical outlet makes this an ideal camping spot for tents, popups, and RVs. 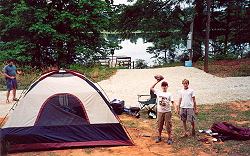 Tim Thorn, Deatsville, Al., and his family routinely camp at lake Gayle. "We love this spot. We always catch fish...I mean big bream. It is great to hear the coyotes and their pups at night along with the hoot owls. We feel safe here...not like in the public camping areas." 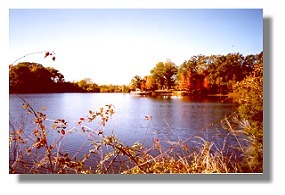 Lake Ely is bordered by woods on three sides and is full of big bass and threadfin shad. It is fun to watch bass chase schools of shad. Ducks visit Lake Ely in the winter along with geese and other waterfowl. 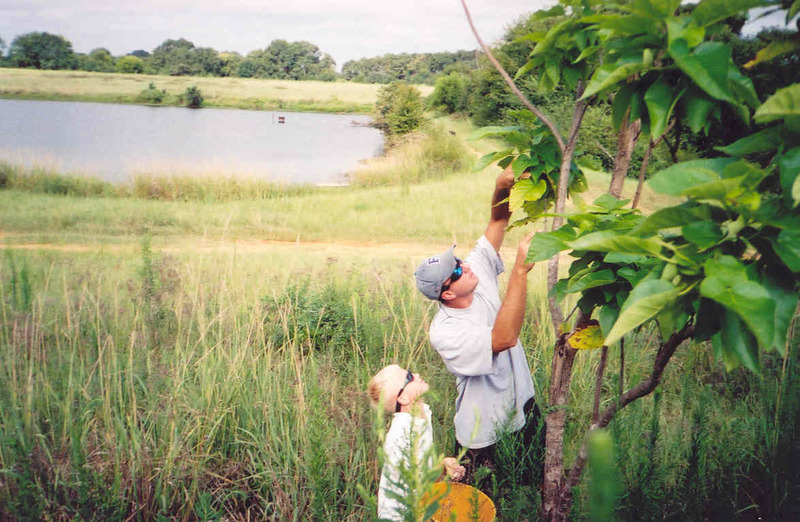 Chad and Hudson Wilson collect catalpa worms from one of many trees planted at the Bar-D Fishing Club. These trees are near Lake Emma Lou. This late crop of worms appeared in early September. 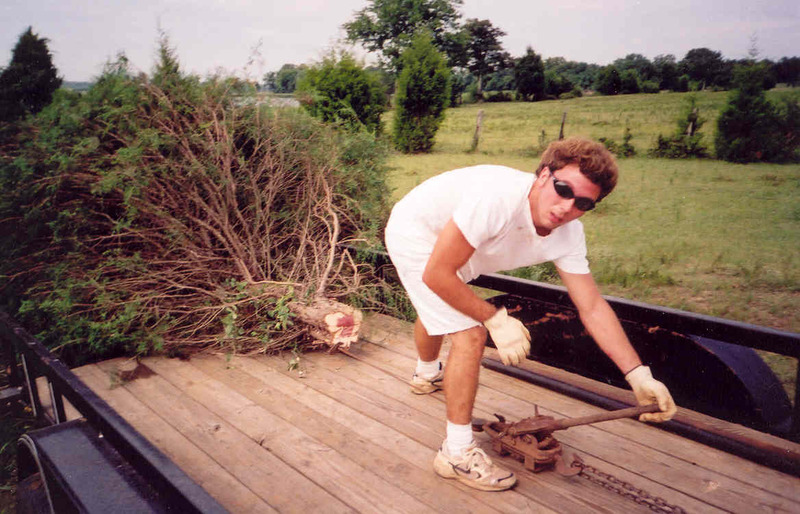 Michael Woodfin used a come-a-long to pull cedar trees on to a trailer headed for a Bar-D lake. 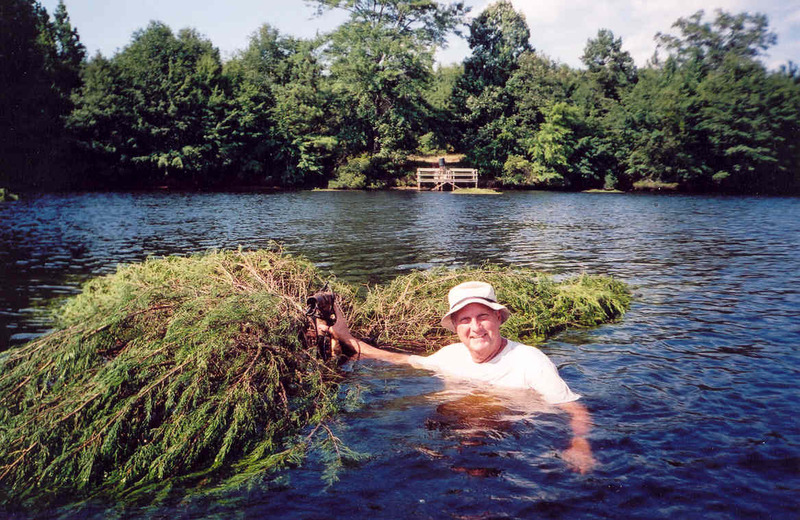 Manager Wilson had the job of tying cedar trees to poles for structure in the lakes. This collection of trees is in Lake Gayle. 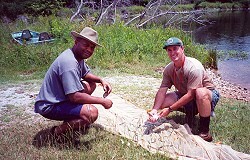 Jay Haffner, District Fisheries Biologist, and Maruice Jackson, Manager of the Marion State Fish Hatchery, checked the Bar-D lakes in June of 2002. "The lakes are in terrific shape...got to be good management...with a lot of luck. If I lived a little closer to Marion, I would join this club."